A happy new year to everyone! There was a real treat before Christmas (actually on Thanksgiving Day for me) when I saw that we do indeed have two mandarin drakes on the canal, not just one. I had begun to have my suspicions when people seemed to be seeing it in two places at once, then my neighbour saw them together, then I did. I don’t know if it is just another one that’s joined us from someone’s collection, or whether one bred here during the year. This year I will be writing about some special wildlife places around the Village area, and some special types of wildlife, so it will not be quite so strictly seasonal as last year. Special wildlife places don’t come any more special than those designated as protected ones. There are several different types of designation for wildlife protection. At a big level, there are our National Parks and Areas of Outstanding Natural Beauty. We have neither of these in our area. Then there are SSSIs or Sites of Special Scientific Interest, which usually contain rare plants or animals. We do have a few of these, but often they are not accessible to the public. There is one along the north side of Upper Bittell Reservoir, where there are rare shoreline plants. The other is Grovely Dingle near Hopwood, an example of ancient woodland. Next come nature reserves. These can be nationally or regionally designated, and are usually run by local Wildlife Trusts, ours being the Worcestershire Wildlife Trust. Some reserves are closed to the public, some have paths through, and some are completely open access. Many don’t allow dogs. Those locally with some access are Newbourne Hill, Penorchard Meadows, Beaconwood & Winsel, Broadmoor Wood, Upton Warren, Piper’s Hill and Lion Wood. There is also the wonderful Eades Meadow, a national nature reserve. The Woodland Trust manages other protected sites. There aren’t any in the immediate vicinity but some nearby include Pepper Wood near Fairfield and Uffmoor Wood near Romsley. Country Parks give access to the public, and protection of landscape and wildlife: local ones include the Lickeys and the Waseley Hills, and Arrow Valley not far away. These are usually open access, some with facilities for disability. There are also private reserves such as Peck Wood, open at certain times. Less well-known are the designated Local Wildlife Sites, which have some protection against inappropriate development. Here they include the canal, Bittell reservoirs, a meadow near Foxhill Farm above Withybed Green, The Meadows in Alvechurch, the old fish ponds in Alvechurch, and Peck Wood and other parts of Rowney Green. Some of these have public access, some don’t. There are other small reserve areas, like the protected roadside verges near Romsley and Waseley. In some ways, I wish we didn’t have these special sites. If we looked after all of our environment properly, we wouldn’t need them. But at the moment we do. When we talk of wildlife reserves, some people automatically think of rare wild animals or birds. But more usually the reserves are disappearing habitats that need protecting so we can have the ordinary animals, birds and insects which are rapidly disappearing. It is encouraging that people managing these sites have moved over recent years to a much more whole-environment perspective, rather than just trying to preserve what’s there, or look after specific rare things. This was brought home to me recently listening to the head ranger of the Lickeys Country Park. He said the environment and wildlife were now the top priority, over-riding leisure pursuits and economic value. I heard a similar message at meetings with the managers of Bittell waters, who have a much stronger focus now on the sustainability of their reservoirs and their feeder streams. Because of this, one thing you will see if you visit several of these special areas is a restoration of habitat which had disappeared or was in danger of disappearing. Newbourne Wood at Rowney Green is a good example of this. Newbourne Hill is interesting geologically. It was formed by a glacier that deposited sand and gravel over the local clay marl. This gave it slightly different flora and fauna, but also meant it was worked for gravel like much of Rowney Green. In the 1950s it was planted with trees, mostly non-native conifers though with some native trees as well. As usual at that time, the idea was to work the wood commercially for timber. The wood was given to the Wildlife Trust and was not used commercially. Their policy was to gradually remove the alien conifer trees, though they didn’t do this for a long time. Up to 2014 the wood was rather disappointing for wildlife. The conifer trees block out sunlight so not many other plants grow, and no flowers to speak of. There was some good bird life, including siskins and redpolls, and some autumn fungi. There was always a nice stretch at the bottom of the wood with native deciduous trees and bluebells. Then last year a swathe of conifers were cut down, and last December a group of local people replanted with hundreds of native trees. This was not only good for wildlife, but good for the local community as well. I saw people of all ages involved with the replanting. Now there is an open stretch with young trees and ever-increasing flowering plants. It will be interesting to see what these are. An even more radical change has been taking place on the Lickeys, where they have also been removing some of the alien conifers, and also had to clear rhododendron and other plants affected by disease. The tops of the Lickeys used to be open heathland. This is a very special geological area, once a tropical sea and later a volcano zone. The soil is more acid than elsewhere locally, and has a special kind of heathland dominated by heather, with bilberries and other acid-loving plants. Not much of this was left after all the planting in the last century. So, in parts, the trees and bushes have been cleared and some extra heather introduced from another local source. Soon there should be a resurgence of heathland – one of our most threatened habitats. It should be a good place for lizards, snakes and butterflies – not to mention bilberries! 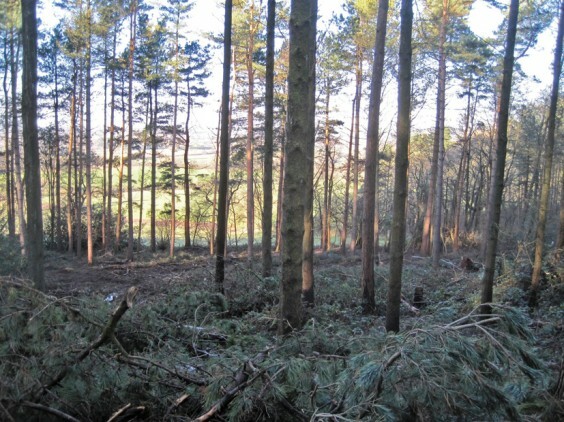 In other parts of the Lickeys, traditional mixed deciduous woodland has been replanted to replace conifers. This was done on a cold snowy day last winter, involving the children of the nearby primary school. Again, the value to local people is important as well as the renewed wildlife. In the southern part of the Lickeys is Pinfield Wood, which is genuine old woodland with all those familiar flowers such as bluebells, wood sorrel and yellow archangel. Here the emphasis is on maintaining the habitat rather than changing it. This does mean cutting some trees, especially coppicing them, and keeping the wood open enough for light to penetrate – managing the wood as it has been done for centuries. All of this is a reminder that habitat has to be managed to allow wildlife to flourish. There is no “wild country” in England, but there are wild plants, animals, insects and birds. Until we can all look after their habitat everywhere, they need these special places. Both the Lickeys and Newbourne Wood are open for walking: there are paths to follow and it’s best to keep to these and respect the wildlife. There is a free car park at the Lickeys Visitor Centre and you can get maps and descriptions of walks. The Lickeys now has a new booklet of walks for different interests, including a disability-friendly one and a sculpture trail. To get to Newbourne Wood, you can walk from Alvechurch via Lodge farm lane and the fields, or from Rowney Green there is a good track near the village hall, and a signboard when you get there. It is less well known that the whole length of the canal through our patch is a locally-designated wildlife site. It is typical of a more modern approach to conservation – the maintenance of continuous corridors. Without these, the isolated patches of good habitat in reserves won’t work long-term. Animals, birds and insects need to travel along their habitat, and it’s no good if they go half a mile across a nature reserve and find they have reached a weed-killed, insecticided field. All over the world attention is being given to these corridors, including “jaguar corridors” in central America. Unfortunately the history of protecting and developing our canalside habitat has been – to say the least – patchy, as you’ll know from my past articles. But nature is tough, and we mostly have good trees, aquatic fringe plants and woodland edge plants, with patches of open meadow habitat, and all the life that goes with them. And the towpath gives wonderful access to all. In recent years the Wildlife Trusts have been doing much more work outside their reserves, especially working with farmers. They are trying to link up their meadow reserves with wildlife corridors, and have grazing partnerships with cattle farmers to maintain their meadows. They are now working with landowners, Severn Trent and public authorities to improve water quality and water flow in the rivers Teme and Arrow and the brooks in and around Bromsgrove. I will write about some more of these designated places during the year, and some other special places which haven’t got any recognition. With all of them, there is a difficult balance to be struck between managing a wildlife-friendly habitat, and giving people access to the countryside. People, especially on wheels and with power tools, can be very destructive of plants and soil, the basis for all our wildlife. But we can also be the ones who maintain habitat so everyone can enjoy it. And even in January, you can enjoy the waterfowl on the canal, or the earliest flowers – hazel catkins, gorse, daisies, winter heliotrope, white deadnettle and hogweed. There is a lot of insect life among them, and some early birds are mating. The wildlife corridor is there, waiting for the spring. The Withybed Poets have provided an anthology of poems inspired by the canal, which the local Canal Society is selling – look out for it at events. Our last collection of poems was for St Laurence Church, for their Windows appeal, from which this new year poem comes. Our next one will be for Alvechurch Baptist Church, inspired by their Christmas Tree Festival. Out of dark winter into brightness and life. I think of the first coming of windows. Through the hole in the roof: whose thought was it? Had nothing on this, this spinning of light. Live in the blessed sunlight and the starry dark. Impossibly gold, heaven’s sun here on earth. As if the makers couldn’t keep them out. To the blue sky, pierced by pink at dawn.